In A Duke in Shining Armor, a character’s close encounter (offstage) with a hackney cab triggers events. At other times, the characters travel, for reasons of anonymity, in hackney coaches. Though some authors use the terms interchangeably, these are two different vehicles. The photograph of a model at the London Transport Museum offers a 3D view of the two-wheeled, one horse single-passenger cab. It was also known as a coffin cab, for two reasons: (1) the vehicle looked like a coffin and (2) it was dangerous. The model makes it easier to see the apron that protected passengers from kicked-up dust and stormy weather. Henry Charles Moore's Omnibuses and Cabs tells us, “The fore part of the hood could be lowered as required, and there was a curtain which could be drawn across to shield the rider from wind and rain.” The curtain is hard to see—and I didn’t see it until recently, when I lightened the photo, but one can just about make it out, tucked away inside. The Cruikshank illustration below emphasizes the coffin aspect. A new and improved version, introduced in 1823, carried two passengers. In my 1830s-set books, I use the later version. Images, left to right: Cruikshank's illustration for Sketches by Boz; illustration from Omnibuses and Cabs; detail from James Pollard, Hatchetts, the White Horse Cellars, Piccadilly, via Wikipedia. "There is a hackney-coach stand under the very window at which we are writing; there is only one coach on it now, but it is a fair specimen of the class of vehicles to which we have alluded - a great, lumbering, square concern of a dingy yellow colour (like a bilious brunette), with very small glasses, but very large frames; the panels are ornamented with a faded coat of arms,** in shape something like a dissected bat, the axletree is red, and the majority of the wheels are green. The box is partially covered by an old great-coat, with a multiplicity of capes, and some extraordinary-looking clothes; and the straw, with which the canvas cushion is stuffed, is sticking up in several places, as if in rivalry of the hay, which is peeping through the chinks in the boot. The horses, with drooping heads, and each with a mane and tail as scanty and straggling as those of a worn-out rocking-horse, are standing patiently on some damp straw, occasionally wincing, and rattling the harness; and now and then, one of them lifts his mouth to the ear of his companion, as if he were saying, in a whisper, that he should like to assassinate the coachman. The coachman himself is in the watering-house; and the waterman,*** with his hands forced into his pockets as far as they can possibly go, is dancing the 'double shuffle,' in front of the pump, to keep his feet warm." This chapter of Omnibuses and Cabs: Their Origin and History tells the whole story, with excerpts from Sketches by Boz. *First published November 1835, in Bell’s Life in London. **many of the coaches were vehicles previously owned by aristocrats. London had many, many hackney coach stands during the early 19th century. This is where you’d find the hackney coach waterman. Hackney coaches appear upon the stand for hire, at seven o’clock in the morning in summer, and at eight in winter: twelve hundred are allowed to be kept in London and its vicinity, and each is numbered. 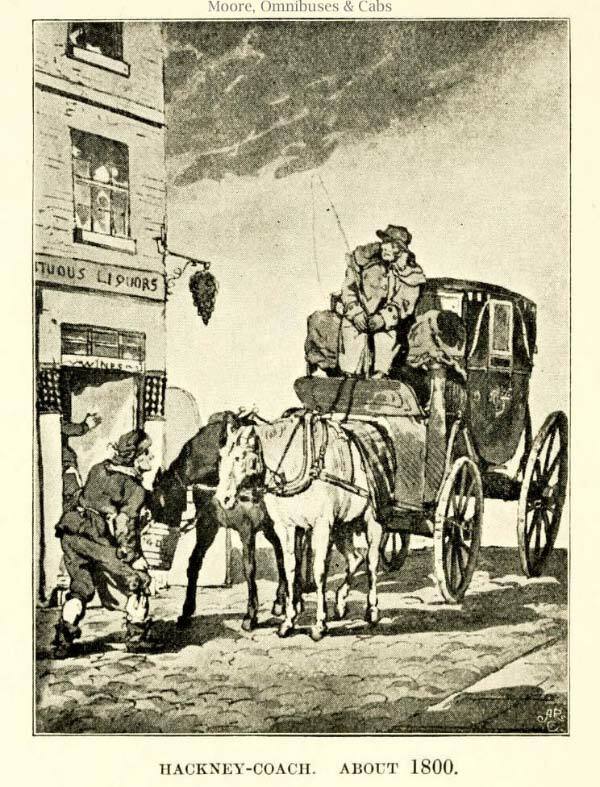 The prices of fare are regulated; and no coachman can refuse to carry passengers for any distance short of ten miles, however stormy the weather, or however the horses may be fatigued. A certain number are reserved to relieve those that have been employed during the day, which are called night coaches, and they attend at their stands till sun-rise. Public houses are kept open during the night for the accommodation of the coachmen. The figure represented upon this plate is employed as waterman to the stand, who is licensed, and wears a badge with his number engraved thereon: his business is to feed and water the horses, and to open the door for the passengers, that the driver may remain upon his box: he also has charge of the coaches during the time that the coachmen take their meals. The office for licensing hackney coaches was erected in the year 1696, under the direction of commissioners; they have a code of regulations, which subjects the drivers to penalties for extortion, carelessness, rude behaviour, &c. by which the public is much benefitted; as the mode of redress is rendered simple and expeditious. —Pyne’s British Costume (originally published 1805 as The Costume of Great Britain). If you haven't yet had enough of the topic, this section of Leigh’s New Picture of London for 1834 gives a concise overview of London transport in the time of my stories.